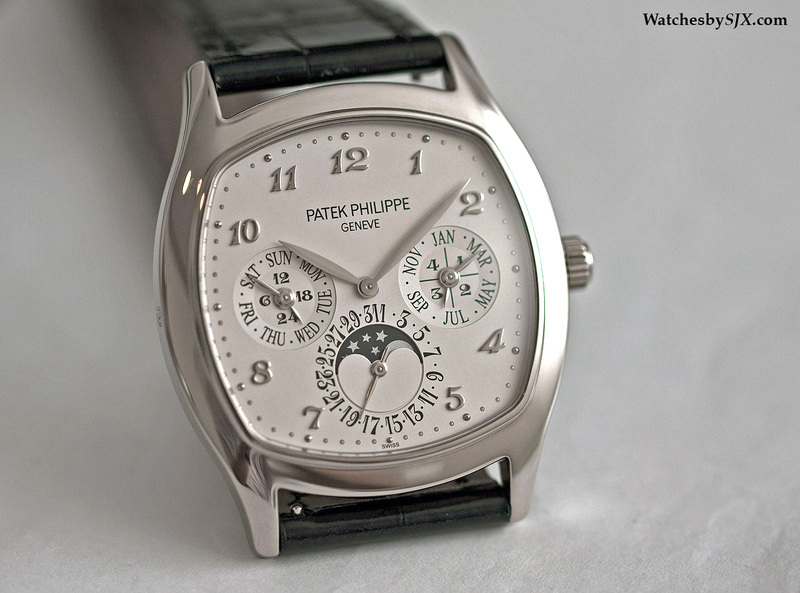 One of the Baselworld 2014 introductions, the Patek Philippe Ref. 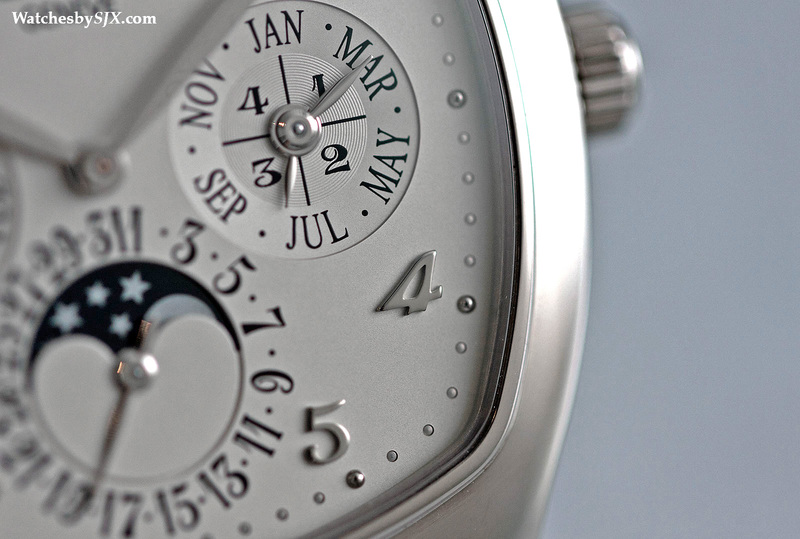 5940G is a cushion-shaped perpetual calendar in white gold with a tastefully executed dial, powered by the calibre 240 Q. 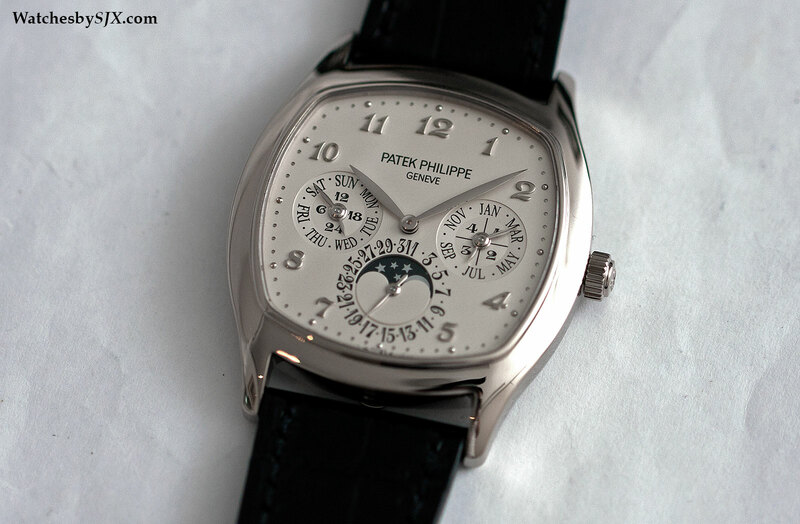 First introduced in yellow gold as the 5940J two years ago, Patek Philippe added the white gold ref. 5940G to the collection this year. The case is carré-shaped (French for square) with the perpetual calendar laid out in the 3-6-9 format typical of the calibre 240 Q. 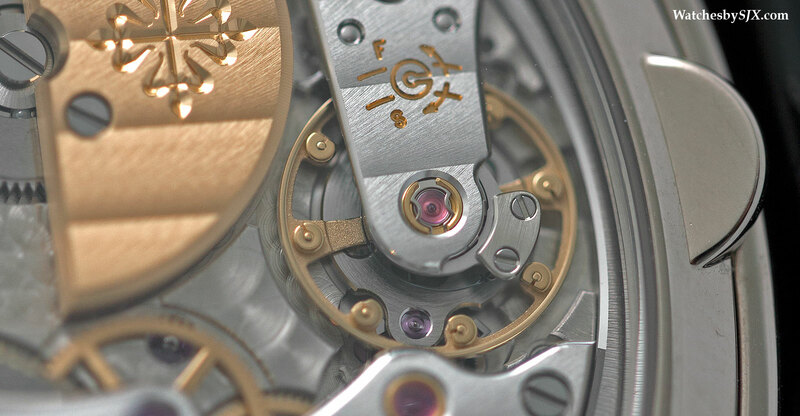 Even though the 5940G has little novelty in design or mechanism, it is a very attractive timepiece. 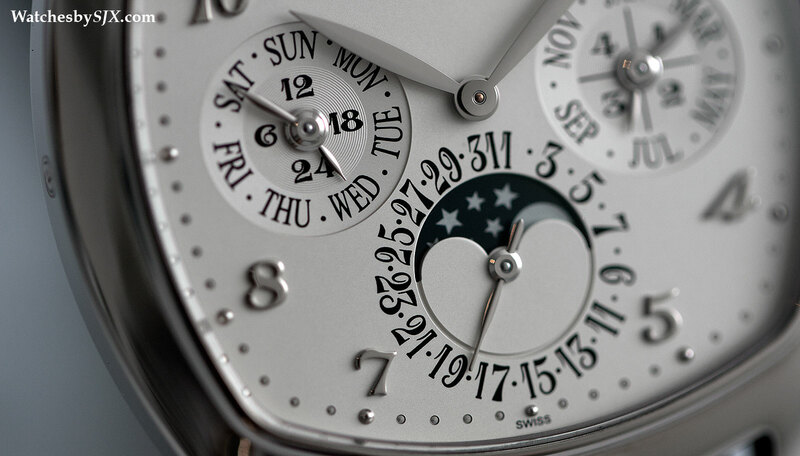 The dial is a silvery-white with applied Breguet-style numerals, with a striking serif font for the numbers and letters found on the calendar sub-dials. This unusual typography is reminiscent of old Patek Philippe pocket watches. This contrasts with the Arial-like font found on most of the brand’s other perpetual calendars. Though by no means large the case has presence, measuring 37 mm wide by 44.6 mm long. 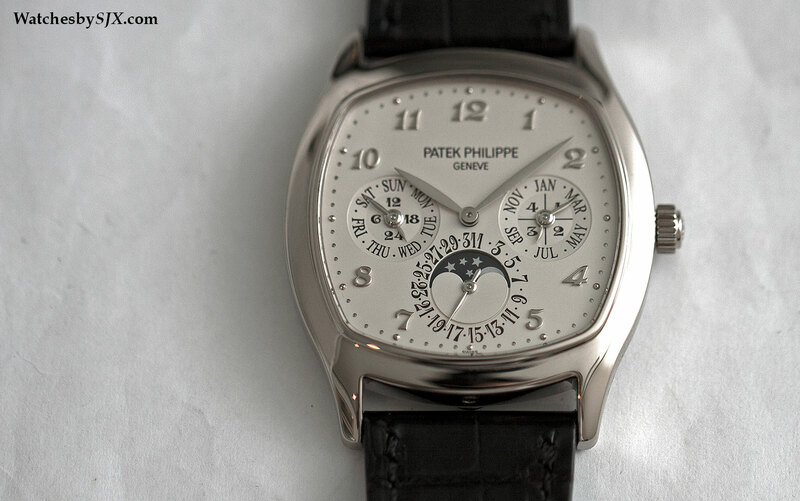 It is a very elegant form, and like most Patek Philippe watches it is slim, with a see-through snap-on case back. The calibre 240 Q (the “Q” suffix stands for quantième, calendar in French) is long in tooth. 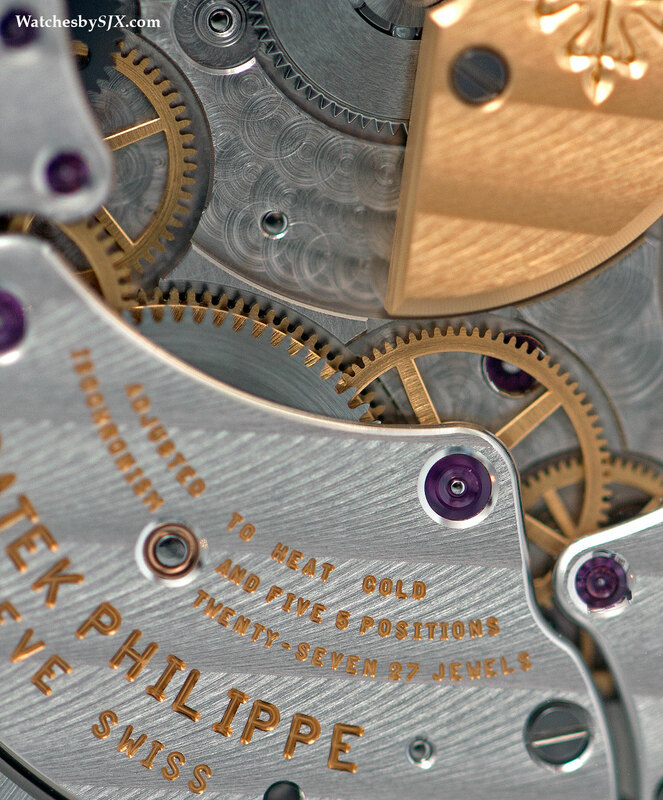 Invented in 1985, it has been in uninterrupted production since then, making it the most common Patek Philippe perpetual calendar movement. While it is a reliable and thin movement (just 3.88 mm high), the 240 Q is relatively low-tech compared to the competition. More recent movements have features like instantaneous displays. And more importantly, they are fool-proof, with no risk of breaking a part regardless of how they are set. Examples include Cartier’s Astrocalendar and the F.P. Journe Perpetual. That being said, the movement is well decorated and pleasing to the eye. 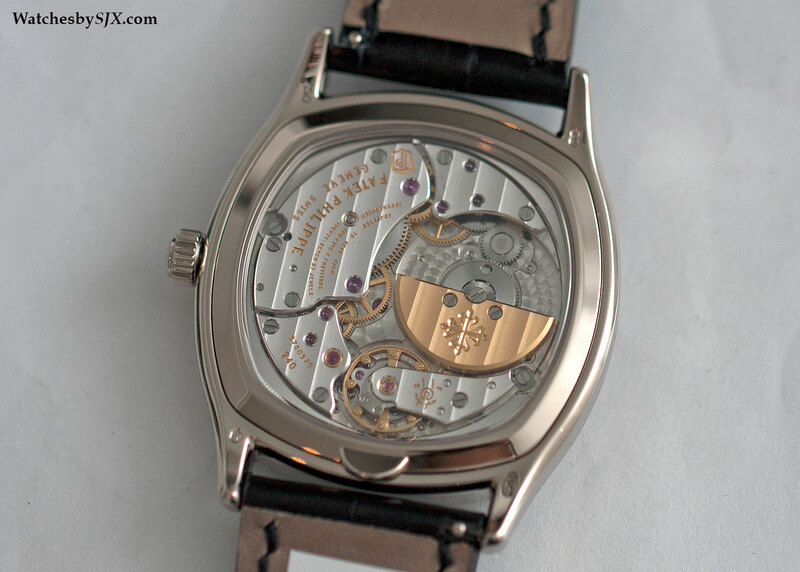 And it features the Spiromax silicon hairspring that is now standard on all of Patek Philippe’s new models. The ref. 5940G is priced at US$93,800 or 115,500 Singapore dollars.